Kids need sharp vision to perform well at school—both in the classroom and on the playing field. Now, thanks to Peach Tree Health’s new state-of-the-art optometry facility in North Sacramento, eye exams and eyeglasses are made affordable for any child who needs them. Following its recent grand opening, Peach Tree Health’s new location has launched a unique vision care service designed to maximize access regardless of ability to pay. 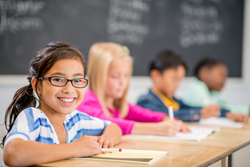 Children with MediCal, MediCare or TriCare benefits may receive exams and eyeglasses with zero out-of-pocket costs. If the family is not already enrolled in such programs, Peach Tree Health administrators help them get covered. For those not eligible, Peach Tree offers sliding scale payments and other ways to minimize costs. This is surely welcome news for local parents. “Affordable vision care has not always been widely available in North Sacramento,” said Greg Stone, Chief Executive Officer of Peach Tree Health. “It is our mission to provide access to our whole community. We are here to keep our neighbors healthy.” Stone added. Restoring acuity of vision to can lead to performance gains at school, in sports and at work. It reduces eye strain when looking at books, computer screens and whiteboards. It also reduces frequency of headaches. With improved performance, comfort and clarity, children enjoy greater confidence in all aspects of life. There are also many health reasons vision care is important for growing children. A comprehensive eye examination can detect diseases such as glaucoma and diabetes that affect not only the eyes but also overall well-being. Peach Tree Health’s advanced diagnostic equipment identifies even the smallest changes in visual acuity and eye health. It also helps identify risk factors for illnesses, which with early detection are typically manageable. Since 2001, Peach Tree Health has been a Federally Qualified Health Center and provides comprehensive medical, dental, vision and behavioral health services for people of all ages in the Northern California counties of Sacramento, Sutter and Yuba. Peach Tree Health operates eight health centers and two mobile dental clinics that serve over 27,000 patients through almost 90,000 visits. The multilingual staff in North Sacramento includes speakers of Spanish, Russian and Hmong. More at http://www.pickpeach.org.